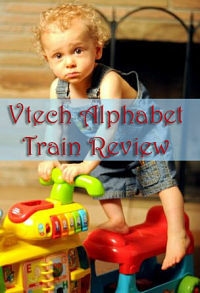 The Vtech Alphabet Train is one of our favorite toys for babies and toddlers. We received it as a Christmas gift when the twins were just infants, and still too young to use it. Our then-2-year-old quickly assumed possession and named it her own. 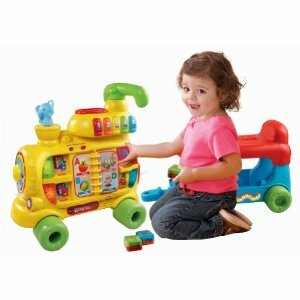 Like most of our Vtech toys, it’s well-made and cleverly engineered to engage and entertain your baby or toddler. Even a baby that can’t yet crawl will be entertained by this train; we like it because it’s big enough to keep both of our twin boys occupied. We usually keep the engine and cargo caboose attached by the integrated hitch. The train comes with 13 alphabet blocks (letter on one side, object on the other). If you put a block into the opening atop the engine, it drops through the engine and shoots out into the cargo car. This also triggers the train to play some music. Our boys just love loading the blocks over and over. The side of the train has four slots where you can insert a block. When you do, the train recognizes which block you’ve put in and which side, and says something like “U is for umbrella. U, U, U!” It’s not guessing, either – there are little sensors on the bottom of the slot that read each block’s unique code. Also, when you flip the pages in the book, it seems to know which pages are visible and reads off the two letters. I still haven’t figured out how it does this, but it’s cool. Touching the elephant conductor gets him to trumpet. Pressing any of the numbered buttons (1-5) causes the number to be spoken. Putting a block into one of four slots or turning the pages of the book. After any of these there’s lots of cheerful music and light displays. And the alphabet song that the train plays is kind of addictive… it sings the alphabet, but ends with “Come and ride the train with me” instead of “Next time won’t you sing with me.” The kids love it. Sit on the cargo caboose. With the caboose hitched on, a child can sit on top of it and grip the green handlebars on the back of the engine. We’ll push the boys around in this fashion. Their older sister can use her feet to push the entire train along. Stand behind the engine. Remove the cargo caboose, and the engine becomes a baby walker. Though it doesn’t have as wide of a base or roll as easily as traditional baby walkers, it’s a great additional “mode” for this already entertaining mode. The storage footprint might not thrill you (we usually stow our train under an end table), but it’s worth the space. 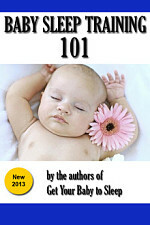 This is a wonderful toy for singles or multiples. And just like we found with our mega bloks, it’s something both boys and girls enjoy. Get one, and it will quickly become a favorite around your house! 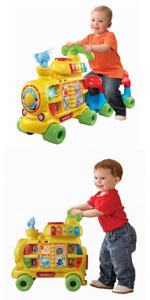 Right now the Vtech Train is on sale with free shipping at Amazon.com.